This building is identified as the Chaplain’s House on the 1881 map of the Cadia Properties and as the Underground Manager’s House on the Post Office sketch map of 1914. It is possibly the Manager’s House, listed in the 1861 Inventory. 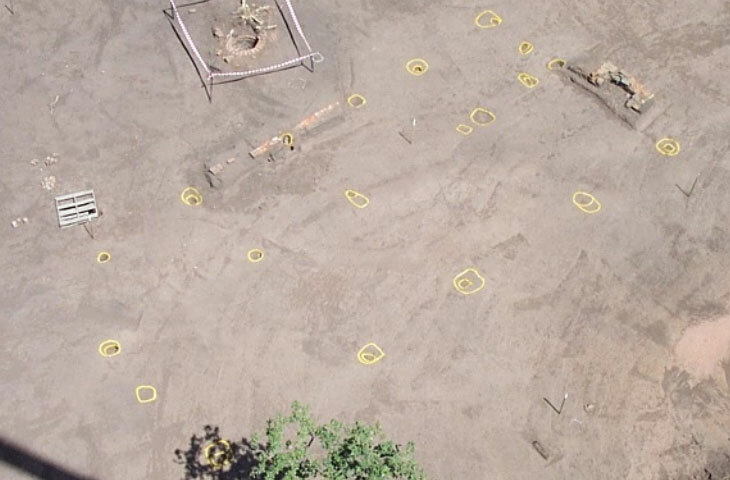 The archaeological excavation revealed evidence for a timber framed building, supported on substantial timber piers. It measured 57 feet long by 16 feet wide (17.4 by 4.9 metres), with an additional lean-to or skillion on its east side. 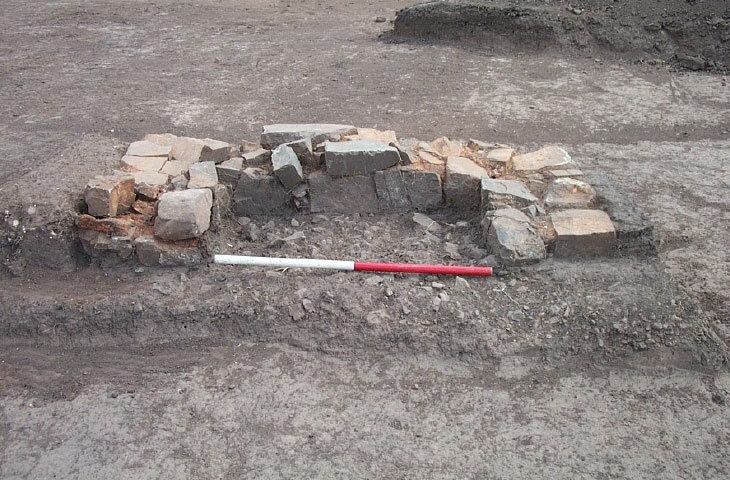 There was a large stone footing for a fireplace in the south wall of the main building. Nothing survived of the superstructure, but the building most likely comprised a row of room, only one of which has discernable evidence for heating. This layout is unusual and may imply both a domestic and work related use. The house fronted at a slight angle onto the slag road that provided access between the West Cadia Mines and the Smelter. In the back yard were some surviving fruit trees and a number of outbuildings including a brick lined well, possibly two toilets and other sheds, possibly for farm animals. The artifact assemblage dated the site from the late 1850s or 1860s through to the 1940s. There was a dramatic fall off in artifact deposition after the 1870s, which mirrors the evidence for the closure of the mine in 1868. The assemblage had a wide range of functions, when compared to some of the other structures. The range of buildings in this complex, together with the broad range of artifacts, is consistent with the house of the Chaplain and later the Underground Manager. It is still unclear if the building can be also identified as the Mine Manager’s House in the 1861 Inventory. There is evidence for and against. The building dimensions are similar to the largest house in the Inventory – 60 by 15 feet. The broad range of the assemblage is consistent with mine management. 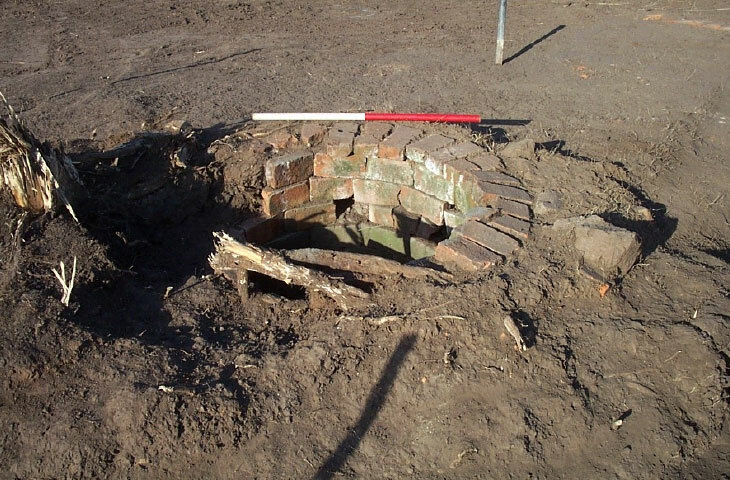 The well is lined with sandstock brick, some without a frog, others with, suggesting a later nineteenth century date for construction or repair. Is this the well in the 1861 Inventory? The brick lined well is the only one found at Cadia Village. Sandstock bricks, some with and some without a frog, were used in its construction and repair. Bricks with frogs date from late in the nineteenth century, but may only relate to its repair. If it was originally constructed in the 1860s, it could be the one itemised in the 1861 Inventory (scale 1 metre) (Edward Higginbotham). Little survived of the Chaplain’s House other than the post-holes where the piers had supported the timber framed structure. The stone fireplace defines the south wall and a line of bricks and post-holes mark the position of the skillion. The brick lined well is in the background (scale 1 metre) (Edward Higginbotham). The construction of the stone fireplace shows the same technical skills used in the construction of the Cornish Engine House. Eynon Deer, mason, was one of the people elected to the School Council in 1863 (scale 1 metre) (Edward Higginbotham).